1. Clean and soaked split mung beans for 2-3 hours, drain and place it in a large bowl. Steam the mung bean for 1 hour or until the beans are soft and easily breaks once rubbed between thumb and fingers. 2. Place the cooked beans in the bread machine with sugar and lard and run the jam making function to a full cycle. 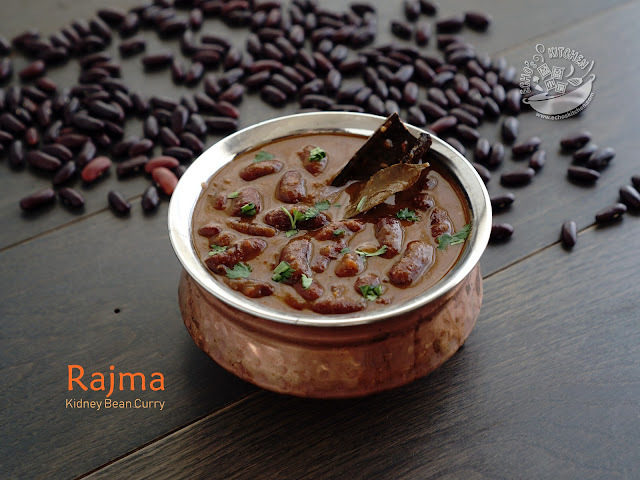 You can also cook the paste on the stove in a cooking pan at medium heat, stir continuously to prevent sticking to the bottom of the pan. 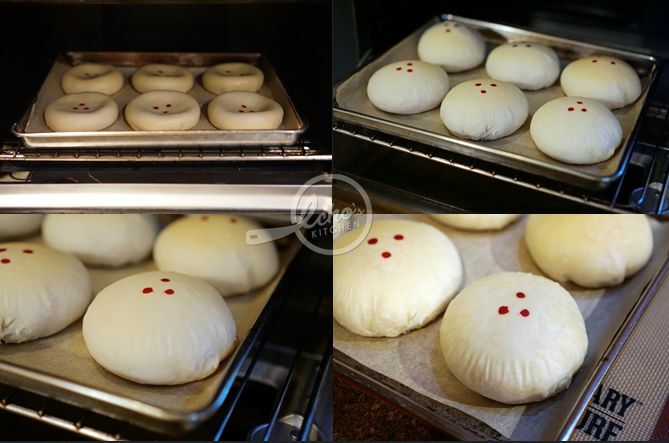 Cook until the mixture form a soft dough. 3. 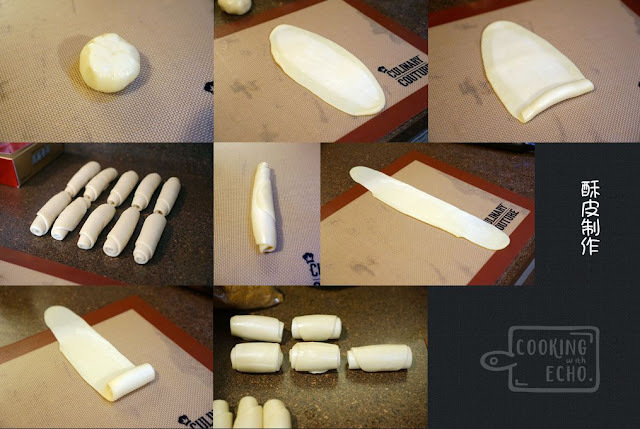 Let cool and divide the paste into 12 equal parts, around 50 g each. 5. 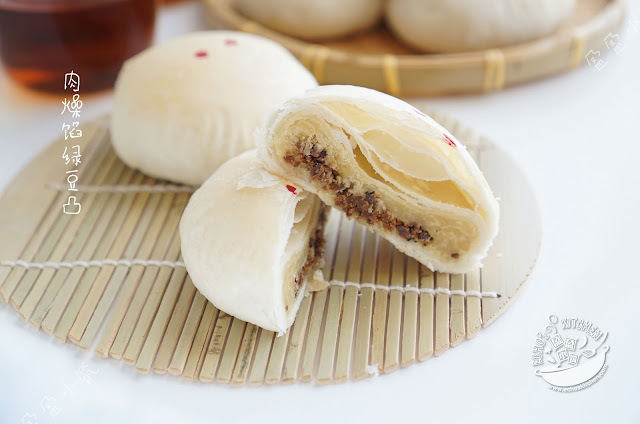 Take one portion of the Mung bean filling and lightly press with thumb to form a small bowl like shape, add 1 tsp of minced meat in it and wrap up to form a larger ball. 6. I also made a few with shop bought fish floss. 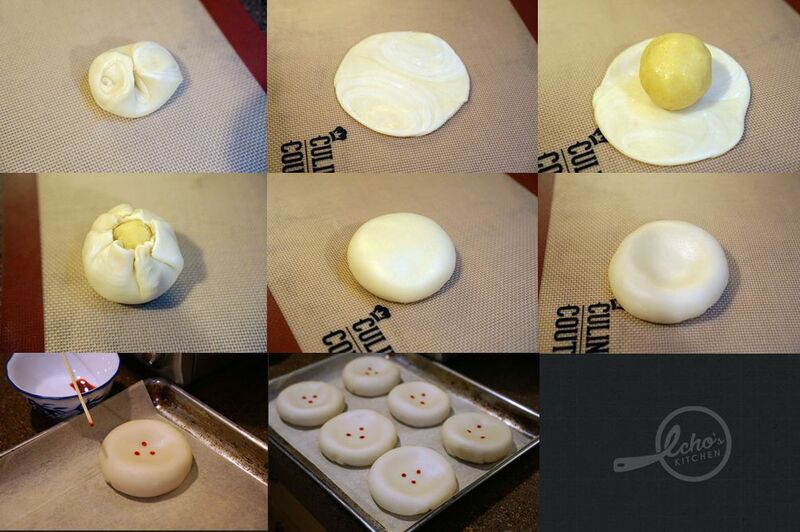 Repeat the steps for all the fillings. Refrigerate for 20 minutes before use. 7. To make the water dough, combine all purpose flour, lard, sugar and water to form a soft dough. Let it rest for 15 minutes before kneading again to form a smooth dough. Rest the dough for 15 more minutes before dividing it into 12 equal parts, 30 g each. 8. To make the oil dough, combine cake flour and lard by slowly pressing and mixing the two using hands to form a dough. 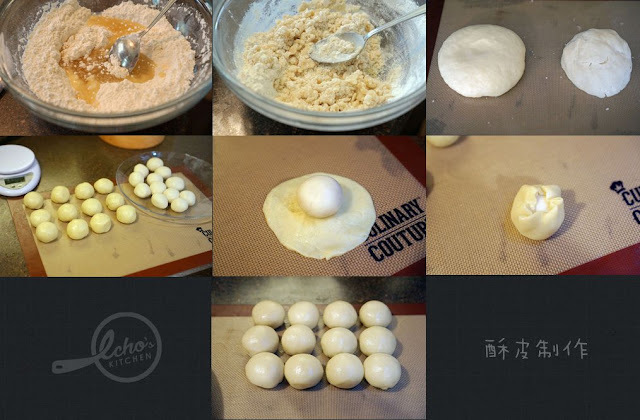 Divide the dough into 12 equal parts, 20 g each. 13. Place a mung bean ball on it and wrap up, pinch to seal to make it into a round ball. 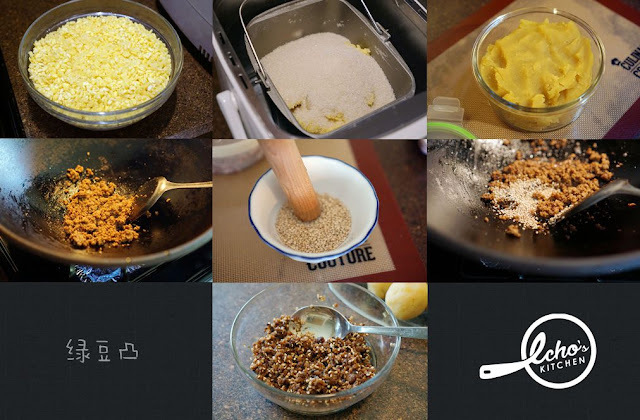 Repeat the steps for all the remaining ingredients. Let the pastry rest for 10 minutes. 14. 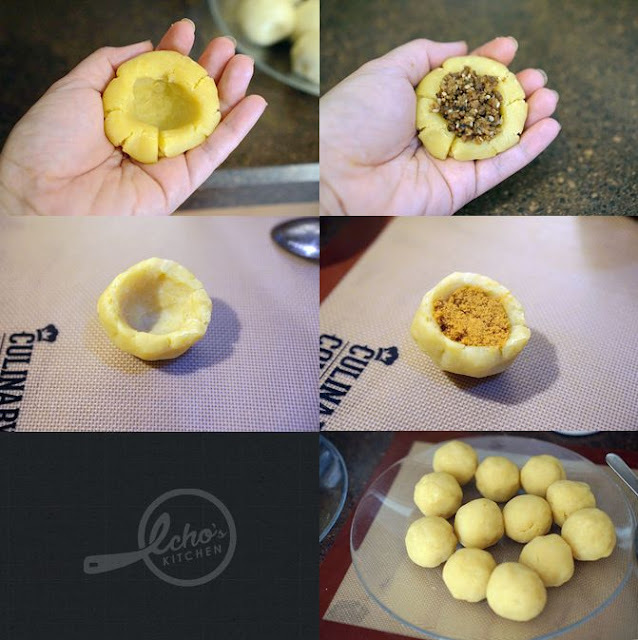 With the help of the heel of palm, make a dent in the middle of the pastry. The dent is the key to the puffing of pastry while baking, it is also where this pastry gets its name from . 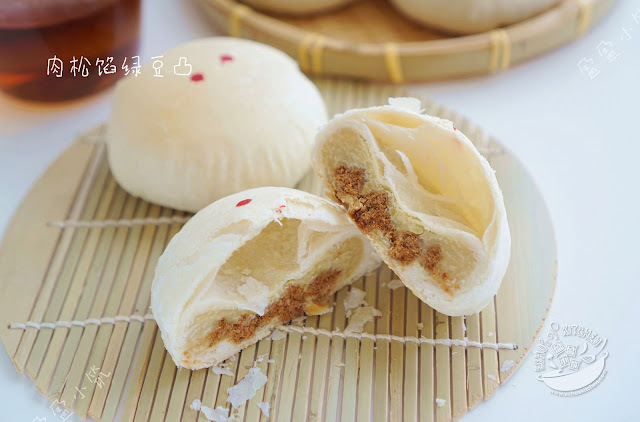 "绿豆椪" or Lu Dou Peng, literally means "Mung bean puff "! 15. 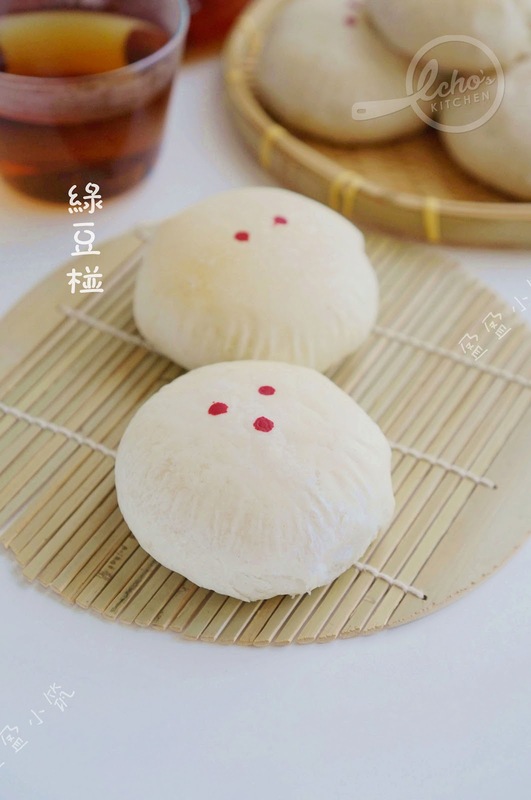 With the help of bamboo stick and some food coloring, or if you have some Chinese wood craft stamps for pastry, use those to stamp some design on the pastry to make it look more celebrating. 16. Preheat oven to 325 F / 160 C and bake the pastries for 10 minutes, bring the heat down to 300 F/ 150 C and continue baking for another 20 minutes. The pastry should be baked at lower rack of the oven at a lower temperature than normal pastry to retain its characteristic white color crust/skin.